Safebox deposit inventory on a letter size paper in a vertical, portrait orientation. keep a detailed inventory of your Safe Deposit Box contents at all times. 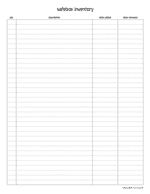 Safebox deposit inventory on an a4 size paper in a vertical, portrait orientation. keep a detailed inventory of your Safe Deposit Box contents at all times. Fridge inventory on a letter size paper in a vertical, portrait orientation. 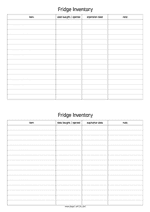 Keep track of all items stored in your fridge and note the date of expiration. This sheet has two handy inventory lists. 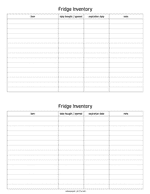 Fridge inventory on an a4 size paper in a vertical, portrait orientation. Keep track of all items stored in your fridge and note the date of expiration. This sheet has two handy inventory lists.